HI GUYS!!! This is a writing prompt that one of my friends shared in one of our groups and the short piece that I wrote to go with it – just wanted to share… Have a great Day!!! 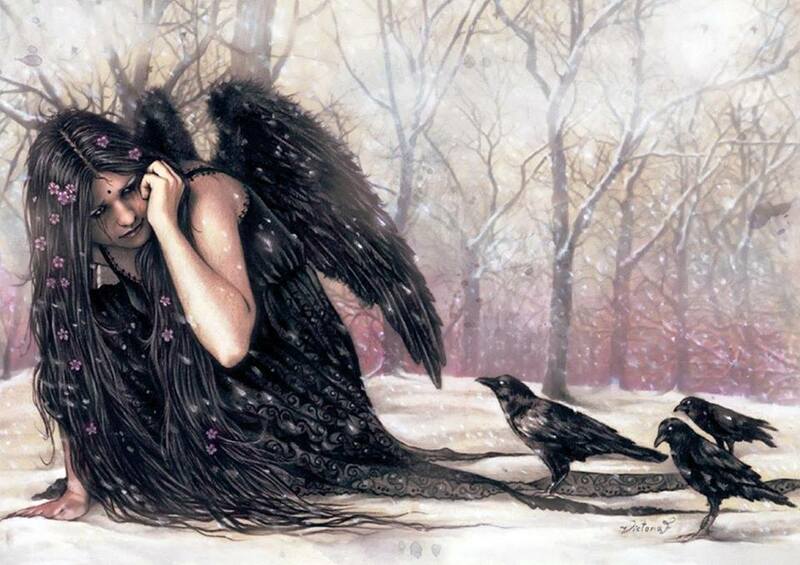 Corina knelt in the snow, watching over her friends in the swirling frost. A smile curled the edge of her lips as she caught the glimpse of large white wings fluttering across the small frozen pond. Daniel, Divinity of the Doves, tending his flock with equal enthusiasm. Glancing at her underlings, she considered if she would have time to meet him, or if she would be missed. Slipping through the leafless trees, she made her way around to the far side of the clearing, catching up to her lover on quiet feet. “Hello, stranger,” she cooed to him, beating her wings gently in the crisp air. Only grinning in response, Daniel shook his blond curls and grasped her hand, guiding her back into the serenity of the barren saplings. “You come to me again, my dearest,” he whispered into her dark locks as they shared an embrace, the taste of her lips a bit salty in contrast to the sweetness of his own. “Of course, my darling, and I always shall.” Her pulse was quickened as he ran his firm fingers to tempt her into more willing poses. “Ah, but you know, birds of a feather…” he mocked her gently. His blue eyes danced as he considered her again, her black feathers in sharp contrast to his white. “Soon, Corina. Soon we will find our way and leave this place forever.” Seeing a shadow move in the distance, he stiffened against her. Sensing his distress, the Caretaker turned and peered through the forest, well aware of the consequences if they were caught. “What is it, Daniel? What do you see?” Her pulse thumped in her ears now, loud in the quiet of the winter’s day. “Nothing,” he whispered, “I am sure it was nothing. But you should go.” He slid his hands over her willing curves again, dropping his warm lips for one last taste of her, reveling in the splendor of their amour. Pulling away from him slowly, she obeyed with quickened steps. Slithering through the desolate trunks once more, Corina padded along to rejoin her fowl, dropping easily to the ground nearby and calling them to her side. Over her shoulder, the shadow moved once more, angry eyes glaring across the clearing, staring at the white wings of his adversary. Moving out of the cover of the bush, he sauntered up next to her, the girl he claimed as his. “Good day, Corina, tending to our kin I see,” his deep gravelly voice praised her in earnest. Not turning to meet his gaze, her palms grew sweaty as she realized she might have been seen. Failing to garner a response, Cronos pushed for more, “You are looking as lovely as ever, my betrothed,” he caressed the ebony plumage of her left wing as he spoke. “I am not your wife!” her words sharp as her eyes snapped to take him in, shifting to remove her feathers from his grasp. A deep, earthy laugh escaped him. Corina did not follow his stare, well aware of what he was looking upon as he spoke. Swallowing hard, she stood with the bits of snow stinging her legs as it began to fall more thickly around them. Finally, reaching out, she grasped the cold fingers of his right hand, longing for the warmth her lover’s skin would have afforded her. “You have no worries, Cronos. You know our day will come, and I will take my place beside you.” She offered the lie sweetly, hoping to placate him and protect the man she loved. Cutting his eyes back to her, he considered her silver tongue. “You have no place with him. We are creatures of the darkness. Remember that.” He pulled her body against his, roughly caressing her in the chill before releasing her as he made his way back into the trees to leave her to her thoughts, the night closing in around her in the quiet of the woods.